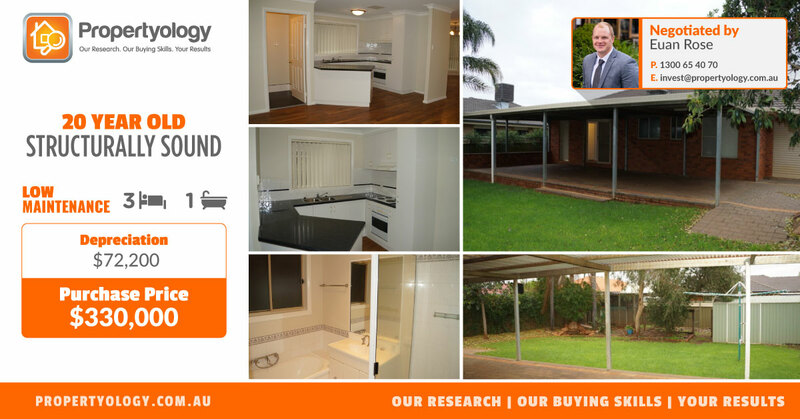 This well presented 3-bedroom, 1-bathroom home which we recently assisted first time PROPERTYOLGY clients Leigh and Leonie purchase is just another example of why the saying “you must buy new to obtain depreciation” is completely untrue. After purchasing this 20 year old property for an exceptionally affordable price of only $330,000, Leigh and Leonie have just received their independent Tax Depreciation Schedule which confirms there is still over $72,200 worth of depreciation available to be claimed in the property. What many people forget, is that just because a property isn’t brand new, doesn’t mean there isn’t depreciation available. More often than not, anything new can be depreciated, new carpet, new curtains, a new bathroom, even a new clothesline! So whether the property is 5 years old or 105 years old at PROPERTYOLOGY we always strongly encourage our investors to obtain an independent Tax Depreciation Schedule. The property itself is now tenanted at $330 per week (5.2% rental yield) and is situated on a quiet street in an exciting regional location which PROPERTYOLOGY has been investing in for just over 18 months. The city has a diverse economy (very much akin to that of a capital city) driven by retail, tourism, health, education as well as agriculture and mining. With sustainable long term employment opportunities and controlled supply, this location has seen average annual growth in excess of 7% year on year over the last 15 years. Overall we think this is a fantastic first investment property and look forward to helping you continue to grow your property portfolio over the coming years Leigh and Leonie. Congratulations again!